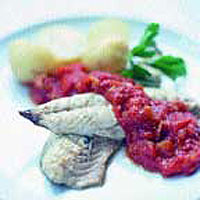 Mackerel fillets are neat, quick and easy to cook. They're particularly good for frying, or if you want to, you can braise the fish in liquid. By far the easiest thing is to get the fishmonger to fillet the fish for you, but it's not difficult to do yourself. Keep the fish ungutted as this makes the filleting much easier. Use a sharp, flexible filleting knife and begin by cutting down into the flesh in front of the tail to mark the start of the fillet. Then take the knife sideways along the fish towards the head, with your hand flat on the fish, using a stroking motion to cut the flesh away from bone in one piece. Cut down into the flesh behind the gills to mark the end of the fillet. Repeat on the other side. Discard the head, tail and innards in between. Rinse the fillets under the cold tap and pat dry with kitchen paper. They are now ready to cook. Make the sauce first: in a large frying pan, fry the celery stalk and shallots with a good pinch of salt in the olive oil until very soft and golden. Add the chopped tomatoes and soft brown sugar and simmer for about 20 minutes, crushing down any big chunks of tomato, until the sauce is thick. Stir in the rose harissa, season to taste and keep warm. Heat a large griddle pan till hot and brush with oil. Put the mackerel fillets in the pan, skin side down. Cook for 2 minutes or until the skin is golden then turn them over, and cook for another 2 minutes or until the fish is opaque and firm to the touch. Serve with the hot sauce and new potatoes. This oily fish and sweet, fiery sauce would both benefit from a fresh, fruity rosé.